In a sea of gold and green, hundreds upon hundreds of dandelions spot the lawn surrounding Seaholm. These yellow-flowered plants, their petals soon to be replaced by seeds, stand strong between blades of grass due to the Birmingham district’s landscaping policy. Across Birmingham schools, according to Assistant Manager of Operations for BPS, Matthew Hess, the administration avoids using both herbicides and insecticides. Still, there are exceptions to every rule. According to Michigan Sierra Club Representative, Italia Millan, Birmingham schools is doing the right thing by using these chemicals sparingly. However, she said, they should take it further by cutting pesticide use all together. Pesticides can have a multitude of effects on both the environment and people, according to Italia, depending on the brand on the amount people are exposed to. The Environmental Protection Agency reports that certain brands of pesticides are poisonous to humans. According an environmental group known as Beyond Pesticides, there is known evidence that pesticide exposure, even at low levels, can adversely affect a child’s neurological, respiratory, immune, and endocrine system. Pesticides like pyrethrins and pyrethroids, organophosphates and carbamates, are also known to cause or aggravate asthma symptoms. MSU Extension Horticulture Educator, Robert Bricault said, however, that pesticide use can be needed. Bricault said herbicide use can also be okay, if applied in moderation. When it comes to fertilizing, both Bricault and Millan agree: fertilizer can be a necessity for lawns, but should only be applied after individuals or businesses know what’s missing from their soil. They can know this by testing their soil for nutrients like phosphorous and nitrogen with a kit available through MSU Extension. If people are ignorant of what their soil needs, or fertilize too much, the excess nutrients in the fertilizer could run off into local water systems and cause an abundance of algea growth. This is known as Cultural Eutrophication. “[Algea] takes oxygen from the lakes and it can affect the fish that live there because they need oxygen too,” Millan said. According to Hess, Birmingham Public Schools follow this philosophy and fertilizes, at the most, twice a year. However, chemicals aren’t the only landscaping tools that can have adverse effects on the environment. 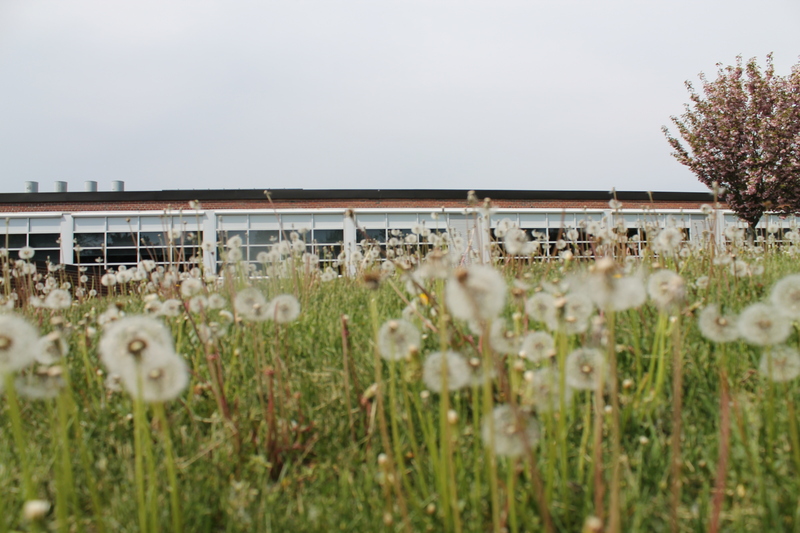 According to Hess, the general lawns on Birmingham District school property are cut down to three inches and mowed weekly by a contracted service called United Landscape. Bricault said these three inches are the optimal height for grass. Bricault suggests mowing every seven to 10 days, depending on the weather, or taking off one-third of the grass at a time. Millian agrees with Bricault on the optimal length for grass, however her reasons slightly differ. She said, keeping the grass high and mowing less often is better for the environment, as not as many pollutants are emitted into the atmosphere. Pollutants from lawn mowers are the same as from cars, including carbon monoxide, violate organic compounds, and nitrogen oxides said peoplepoweredmachines.com. According to the EPA, all of these pollutants can cause any reactions from chest pain to heart disease to adverse respiratory effects, when people are exposed. For Hess and BPS schools, the main driver of landscaping policy is community health.